Jared Plotz joined Ulland Investment Advisors in January, 2017. He leads the analyst team in looking for new ideas and monitoring portfolio positions. Prior to UIA, Jared worked for Cornerstone Capital Management LLC as an analyst since April 2013. He was responsible for coverage of the Energy, Materials, and Industrials sectors and for supporting research coverage across other industries. Prior to joining Cornerstone, Jared was a sell-side Global Automotive & Truck Analyst at Robert W. Baird from 2011-2013, where he helped expand analysis of global industry trends. His other previous investment roles included positions at Leuthold Weeden Capital Management and Ulland Investment Advisors (in 2008), with experience in the Healthcare and Energy sectors. 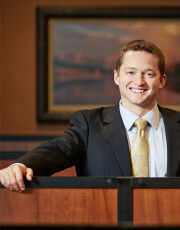 Jared is a CFA charterholder and a member of the CFA Society of Minnesota as well as the Economic Club of Minnesota. Jared graduated from Carleton College with a B.A. degree in Economics and a concentration in Political Economy. Jared earned an MBA at the University of Iowa’s Henry B. Tippie School of Management, where he specialized in Investment Management within the Finance concentration. While at Tippie, Jared managed the Heath Care sector for The Henry Fund – an equity portfolio managed by select MBA students – and represented the school in a number of graduate competitions. Jared enjoys running, hiking, camping, and visiting our national parks. Jared, his wife, and their two sons live in Lakeville. Jared’s wife is a swim coach at Carleton College.